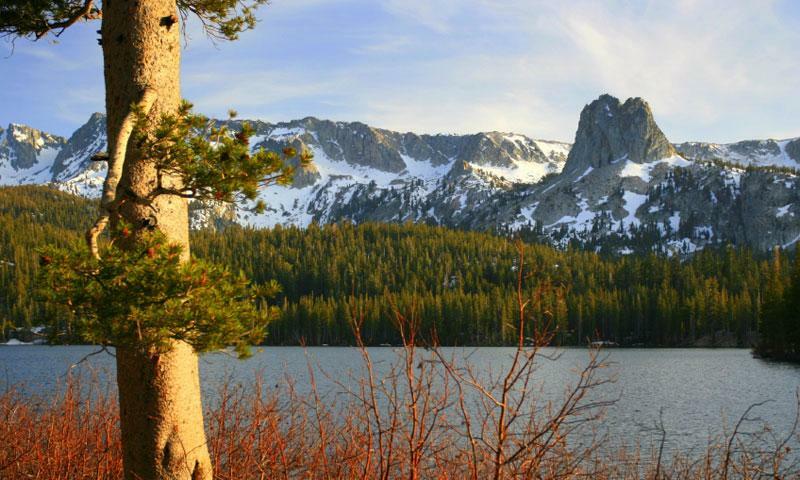 Lake Mary, the largest lake in the Mammoth Lakes Basin treats visitors to spectacular Sierra scenery and abundant outdoor activities including sailing, flat-water paddling, camping, and fishing. Lake Mary is located just outside of town in the Mammoth Lakes Basin. Spend the night at one of 51 area campsites. Make sure to come early, as this poplar campground has a tendency to fill up. Lake Mary (Elevation 8,920 feet) is the largest lake in the Mammoth Lakes Basin at over 1 mile wide. This popular destination treats visitors to breathtaking alpine scenery, as well abundant outdoor activities including lakeside camping, flat water paddling, sailing, and fishing. Lake Mary is located just outside of town in the Mammoth Lakes Basin off of Lake Mary Road. While fishing Lake Mary, expect to catch brown, rainbow and Alpers trout. Popular fishing spots include the Lake George Inlet and the Lake Mamie inlet. At over one mile wide, Lake Mary is the best lake in the basin for sailing. Lake Mary boasts 51 campsites sprinkled along its shoreline. The campground is generally open between the middle of June through the middle of September. Amenities include flush toilets, piped water, and fire grills. Campsites are available on a first-come first-served basis. Take note, the Lake Mary campground is extremely popular, so campsites can be scarce, especially during popular holiday weekends. A great way to enjoy the water at Lake Mary is by kayak and canoe. Remember, all the lakes in the Mammoth Lakes basin are closed to swimming, so make sure to stay in the boat.